Story: Canned chhole and raajma always remind me of the fun times in grad school.. Six of us shared (way more than) groceries in the two years.. there were many nutcases/jerks on campus and it was fun to gossip about them.. in fact, even now when grad school is becoming a distant memory, these almost mythical characters always manage to make an appearance in our conversations... I am sure our kids will have to hear some of these stories as well..
Today's post is dedicated to jerks/nutcases that provide the much needed entertainment in otherwise boring school-life..
A second year grad student requested a few of us, FOB (fresh off the boat) grad students to help out with moving his furniture. Clueless bunch of us went to help out in good faith.. Once all the furniture was moved, with a ton of attitude and not even a tinge of gratitude he said - let me buy you beer. This felt like he was trying to pay us.. that DID NOT go over well. Then he insists - let's go for a coffee.. everyone goes to the closest Dunkin' Donuts and orders coffee. This guy orders coolatta.. we take the first sip of our coffee and find it extremely bitter.. and he goes - "yeah.. I know - the coffee is really bitter. that's why I always order coolatta.. it is the best!" so yes - we were taken for a ride here.. but boy.. have we enjoyed the re-re-runs of this experience when we would bash this guy to no length. Drain the water from the canned chick peas and wash them well. Transfer the chick peas to a baking tray, drizzle olive oil, add the spices and mix well. 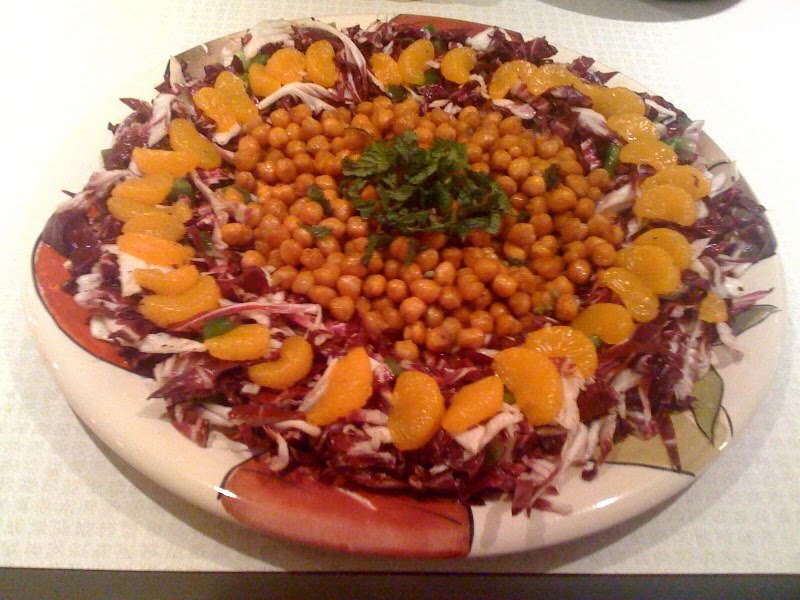 Spread the spice-coated chick peas in the tray in a flat layer. Slide the tray in the oven for 20-ish minutes. Remove the baking tray and enjoy with drinks. 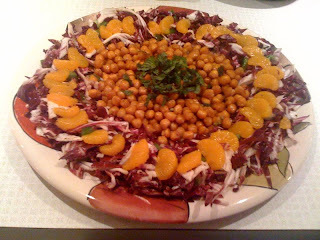 If you want to turn this into a salad like I did mix the sliced red cabbage with chat masala and lemon juice, spread this cabbage in a platter, decorate with mandarin orange supreme and add the baked chick peas in the center and garnish chickpeas with the mint leaves. I enjoyed being the "7th" in this group for a short time. Later on, a certain someone who enjoyed ketchup was the 7th. 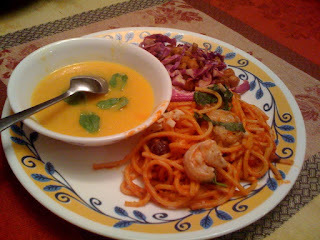 hahhahaha....excellent blog! those memories are still fresh in my mind :)...so does the bitter taste of that coffee....still remember priceless expressions of all of us after taking first sip.